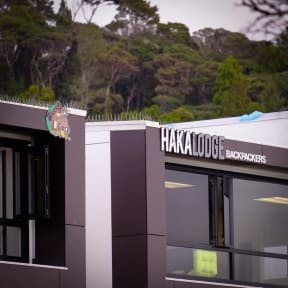 With the best view in Paihia, the most central location and brand new facilities, Haka Lodge Paihia is a great choice! Located across the road from Paihia Beach, we get amazing views over the water, and we are close to all restaurants and bars in town. We are a brand new, premium penthouse backpackers with an ethos that puts the customer before anything else and a team of staff that can help with your every need! We have luxury dorm rooms for those traveling on a budget, and luxury ensuite private rooms for those travellers who like their own space on the road. Our private rooms have their own flat screen tv's and our living area is equipped with a wrap around couch to enjoy the views, as well as a large screen TV for those rainy days! We believe in offering cheap up-market accommodation that is top-end and suitable for a range of people – which means you never know who you might meet in our large open living area, or brand new, top of the line, fully fitted out kitchen!